Peter ****: "Hi Julie & Liam, Many many many thanks for the deal on the clutch basket & plates. That is very much appreciated. You legends you." Craig ****: "Great product,excellent instructions and communication. Highly recommend." 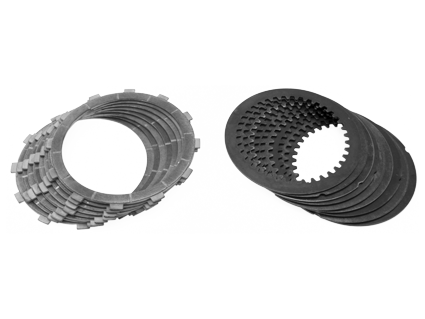 Linda ****: "Good gear [clutch plate set] and good deal." Aaron ****: "Great product $ well spent thanks." Andrew Davis: "Quick report on the part I have got from FastBikeGear... Complete NGR clutch with NGR Hub = Seemed a shame to fit it. Excellent product and the bike is much more responsive with the less rotating weight. NGR Corsa Open clutch cover = Fit is great, looks the part and should protect that loveley NGR clutch should I ever drop the bike on that side! Oberon Ducati Clutch Slave Cylinder = Awesome, fitted as described, easy instructions and works 100%. Ducati Oil breather Valve = Excellent fit and finish, 100% good. Oberon Ducati clutch holder = Fantastic, I love good quality tools and this did not disapoint, probably too nice to hide in a toolbox! Titax Levers, Titanium and with Red levers = Awseome, fantastic feel fit and finish will never go back to 'normal levers'." Mike Cathie: "The S4 is up and running with the new clutch gear, thanks Liam, so quiet I thought I'd forgotten to put the plates in. But everything is doing what its supposed to do so am very happy. New starter motor brushes have given me a whole new starting experience also, so despite the few weeks holed up in the garage it's all been worth it. Thanks for your help and advice, I'll post another comment on the clutch gear once I get a few k's up. Regards Mike Cathie"
Craig ****: "Happy customer. Very quiet clutch now, have a Ducati that doesnt play music to everyone in the street. The clutch basket is a beautiful piece of engineering, tempted to buy another for the mantelpiece. Great to deal with. These alloy clutch plates are surprisingly light, and the high pitch clutch rattle is gone. The old steel basket would make a great dinner bell, or percussion instrument." Todd ****: "Impressed with the weight of the alloy clutch pack you supplied me too. Half the weight!!" Charlie ****: "Just thought I'd let you know my bikes (2001 Ducati 900ss) running a lot better, especially when changing down gears, thanks." ..
Craig ****: "Happy customer. Very quiet clutch now, have a Ducati that doesnt play music to everyone in the street. The clutch basket is a beautiful piece of engineering, tempted to buy another for the mantelpiece. Great to deal with. These alloy clutch plates are surprisingly light, and the high pitch clutch rattle is gone. The old steel basket would make a great dinner bell, or percussion instrument." ..